In retrospect, I had some pretty high goals for my 20% project. I am glad I decided to learn how to ferment food because I love they way the food tastes and I'm happy to learn a skill that creates super healthy food. Unfortunately, I didn't ferment as many foods as I would have liked and I didn't get to interview Mike, but I did speak to my buddy Mike casually about tips while fermenting. Also, I ran into some unexpected speed bumps like trying to drill a hole in the lid of my mason jars, trying to find airlocks ( I had to go to a beer making store 30 min from my house twice because the first time I went they were closed), and trying to figure out how to weigh the vegetables down in the fermenting juices. I enjoyed using Scoop.it! to curate my research and found it convenient and easy to use. My only frustration was that my free trial ended and I was only able to curate one topic. Overall, it was a fun project and I definitely see myself continuing to ferment in the future. Below is a screencast I made about the ShowMe app. This is cool app that I have used with my students. Check out what it can do! I ran into some problems. My vegetables from last time keep floating to the top and I am worried about mold so I had to do some more research. I learned that they sell, or you can DIY, ceramic fermentation weights. I read this girls fun blog, Northwest Edible Life, and she gave me the ideas to make my own weights out of pie weights and a synthetic mesh bad. So that is what I did. Now, my veggies sit comfortably and safely under liquid. I couldn’t find any daikon radish at the store so I used the radish that was available. I also couldn’t find Korean chili powder, so I will have to go to an asian market next time for that. But none the less, I tried it and can’t wait to see how it tastes in a about a week! In the following four articles, teachers have a found a way to incorporate the popular app, Instagram, into the classroom. I love reading about innovative ways to grip students and encourage participation. I believe that using programs and apps like Instagram is transforming instruction and is a necessary way to engage students. Check out the articles below. Every time I sit down to do a lesson plan I think about engaging my students. My biggest challenge is trying to find an activity that allows them to learn the content as well as challenge them. I think rigorous tasks motivate students to try. I try to stay away from meaningless, repetitive math exercises. After reading the article about with kids say engage them, I thought I could commit to the following three ways. One is creating projects that relate to the real world, because it is so easy to do this in math and it is the only way they will grow to love math. Secondly, I will show that I love what I do and be enthusiastic. I think staying positive and loving math will only transfer to the kids and motivate them to see what I’m so excited about! Lastly, I will use more visuals. Doing math problems can be so boring and adding a visual will entice the students and spice things up a bit. This type of challenge turns students into active learners while participating in the lesson rather than just receiving knowledge. On a developmental level, being social is something high schoolers prioritize, so having activities that incorporate content into being social makes it more likely that students will be involved and interested in their own learning process. It lets kids be creative and choose how they want to learn (in this case spanish vocabulary) as well as see what others are doing. It is a way for kids to buy in to their education and to connect with the global community. I would love to do a project like this with my kids. I can see myself using this type of activity with my students. One challenge I think I would come across is assuming that all my students have an instagram account or that have devices that allow them to participate. What do you do if two students don't have smart phones and can’t participate. It is a great enriching activity, but if everyone can’t participate, do we still require them to do it? Also, if a couple students have never used instagram, then there needs to be time set aside in class to review expectations for the assignment, like hashtags and tagging people. I think I would like to make modifications on what they captions say and make sure students are writing something productive and thinking critically about the project and it is actually contributing to their learning, instead of being a superfluous assignment just because it is involving technology. I think the three ways why Instagram is useful in college, ask questions, feed other social networks, encourage participation, are applicable in the classroom too. Pictures are appealing to users, in a social media world, because it conveys messages through images instead of words. You can use instagram in your classroom to get students to ask questions about new units of study, to post to other social networks you have set up in your class like twitter, and to encourage students to participate in creative ways. After reading these articles it seems like Instagram is a pretty useful tool for student engagement, easy to use and free! Now, the trick is staying abreast the rapidly changing technological world and keeping up with our students’ technology interests. What is next? How can we use snap chat in the classroom? Gever Tulley started tinkering school and it is exactly what it sounds like. Kids come to his school for 6 days and build whatever they want and learn through doing. There is no curriculum and no tests. There is just a bunch of stuff, dangerous tools and time, something Tulley says is in short supply in their over scheduled lives. He says that building is at the heart of the experience. After watching his TED talk, I was astounded at the things these kids were able to build! Here we are! Kicking off my 20% project with my first post on fermentation. The goal of this post is to lay out all the ground work and write about some basics of fermentation to get me going. After some research, it looks like Sandor Katz, the author of "The Art of Fermentation", is the man when it comes to fermentation. 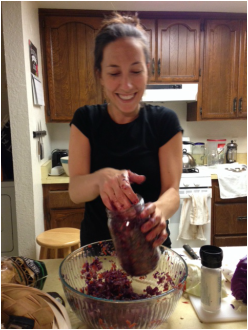 Here is a short intro video that I will follow to make my first jar of fermented food for next time: sauerkraut. 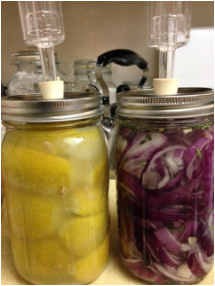 What is lacto-fermentation? This is the process of sugars and starches in vegetables turning into lactic acid by friendly lactic producing bacteria. Why ferment? Eating fermented foods is a great way to get probiotics into your gut. This good bacteria aids in healthy digestion which promotes optimum overall health! Also, there are more vitamins in fermented vegetables and the fermentation process makes it easier to digest them. What materials do I need and what is Whey? From my research, it looks like the materials I need to start my first fermentation is a big mason jar, an airlock, pink himalayan salt, cabbage, carrots, garlic, a knife and cutting board. Whey, pronounced "way", is the watery part of milk that remains after the formation of curds. Whey helps start fermentation in a variety of products. It is important to research and experiment with different types of whey because it can affect the taste of your fermented food. Fortunately, when fermenting vegetables, you do not have to add whey because the organisms you need are already present on the vegetables. What can go wrong? Sometimes, if your vegetables aren't submerged in liquid the whole time, then mold can grow on top of your veggies. If this happens, you can just scrape the mold off and add a little water and continue fermenting. Also, it's important to use clean and uncontaminated raw vegetables and to sterilize the vessel you will use to ferment. Also from Foodsaftynews.com, "Fermented food needs to reach a pH level of 4.6 or lower (which indicates it is acidic enough to be safe). Fermentation, if done properly, will bring food to the “safe” acid level. 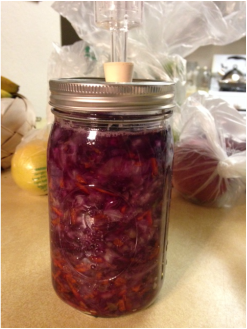 Post 2: Make Sauerkraut and airlocks! Post 4: Kombucha and Kefir! Post 5: Hot Sauce and Kimchi! 1. Problem Solving and Perseverance - Over stimulation and short attention spans make it hard for our teenagers to persevere through rigorous math problems. But perseverance is critical to problem solving and critical thinking! It is important to support yet push students through difficult tasks in order to promote authentic learning and to banish learned helplessness. Perseverance and problem solving skills are essential to innovation and these are the skills our current marketplace demands. 2. Accessing and Analyzing information - There is no doubt that we live in the information age! It's accessible, sometimes reliable, but definitely abundant. Students need to develop the skill of throughly researching a topic by effectively discerning sources, and then analyzing and synthesizing what they find into something useful. An example of how I would like to do more of this in my math class is by requiring students to use their phones, computers or ipads to collect their own data to use in math projects. 3. Developing Character- I feel this was the missing part of Wagner's seven survival skills. As kids develop into adults in high school, it is important to foster an environment that encourages respect and good citizenship. The thing that isn't changing in the workplace is that we all are still living and working together. The classroom is a place that should be modeled like a workplace and students should be expected to act appropriately and have respect for others in that environment. As teachers, we need to model and enforce this behavior as kids are transitioning into adult members of society. A good way to incorporate this into the classroom is to spend a day developing a social contract for the class by discussing what appropriate, responsible and respectful behavior looks like, and then holding students accountable for this behavior throughout the year. 4. Collaboration- Two heads are better than one, so the old adage goes. When we speak about rigor and problem solving, a great support for students is teaching them to effectively collaborate. Collaboration does not look like 4 students sitting together, filling out a worksheet while one person does the work and the others copy. It takes a lot of work to create a classroom environment where students feel safe to share their ideas and collaborate with other students. It is important, as an educator, to support collaboration by creating meaningful tasks, by modeling collaborations skills and by creating clear expectations for students. 5. Fostering Creativity and the imagination- Apple's epic success and innovation came from the late Steve Job's tremendous ability to marry art with technology. He had a keen eye for aesthetics but geeked out with computers. Encouraging children to expressive themselves artistically and imaginatively leads to that great American innovation that we pride ourselves on. Let's not lose sight of how important it is keep the imagination alive and encourage students to transfer their creativity into everything they do, just as Jobs did. 6. Effective Oral and Written Communication- I want to make sure my students are prepared to enter a world and marketplace of hyper-communication through emails, chats, tweets, blogs, articles, etc. It is essential for students to be able to express themselves and their ideas with others in person or written via the hundreds of ways we communicate. 7. Creating identity and a Voice - This skill is a combination of being able to form and support opinions and the ability to effectively express them. As our students move into adulthood, it is important to help them develop their own identity, opinions and their voice. Media is no longer a one way street and anyone can have a significant impact by reaching thousands, even millions, of people through the Internet. Fostering students growth into adulthood by helping them find there place in this world is an essential survival skill. Google is one of the most desired companies to work for, right? They are cool, innovative, and produce cutting edge technology. Their work environment is fun and innovation is celebrated and encouraged through 20% time. It is a dream job. So, what type of employee are they looking for? Well, not necessarily one with a college degree and GPAs don’t matter! The number one quality they are looking for in an employee is the ability to learn and process new information on the fly. They want leaders that will show initiative when necessary and then sit back and let others contribute when needed. They want people that will take ownership and pride in the work. My favorite quote from the article is “Too many colleges, he added, ‘don’t deliver on what they promise. You generate a ton of debt, you don’t learn the most useful things for your life. It’s [just] an extended adolescence.’” I couldn’t agree more with this statement. College degrees are becoming watered down and just having a degree will not necessarily get you a job. Google is an example of a company that is realizing this. To work at a company like Google, you need to be motivated and passionate about the work you are doing. You have to want to create and you have to know how to learn. So, as a teacher how can we cultivate students that are hireable? Motivation is key, but if students are not motivated in every subject do we need to require that they are well-rounded and excel in every subject? Can we let students follow the learning path they are passionate about? This is a big picture view on education but how can I start to create students that would be hired at Google in my personal math classroom? I definitely need to get rid of passive lectures and note taking and let the students have choice in what they are learning. I need to be a more creative teacher and have different activities that all teach the same standard but appeal to different student’s interests and learning styles. Let’s start making our classrooms look more like what the current workforce looks like! After reading the Wiggins' article, I can definitely relate the veteran teacher's experience to those of my students. My students are on a block schedule so they have 3 periods a day and each period is 2 hours long. I love the block schedule as a teacher because you never feel rushed, but I feel for my students by the end of the day. Passively sitting ALL day, 5 days a week is absolutely exhausting and by the end of the day their attention spans are short and they are sleepy! I find myself desperately trying to hold their attention while delivering information before they get lost to their phones or a side conversations with a classmate. Unfortunately, this makes me want to power through lectures without stopping or time to talk to partners because it is difficult to redirect their attention back to the lecture. I think a strategy that what would help this is more hands on activities, as described in the article. I need to work on giving content in 10 minute chunks and then creating engaging activities in groups that require them to talk to others and move around. Because my students have been in the traditional classroom for so long, they need some sort of motivation to put effort into classwork. In math class, they are used to receiving points for homework, quizzes, and tests. They aren't used to doing projects or presentations or anything else in class besides taking notes and practicing problems. I think they ARE capable of putting forth some good effort during class time, they just need something to grab them and get them into the awesome problems of life that math can solve. Additionally, I would like to try and incorporate most of the things that the veteran teacher wished she would have done. For example, it would be awesome to have a nerf game in the classroom, more mandatory movement, and no sarcasm when students ask questions. 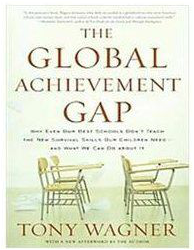 This was a great perspective to read about as I start thinking about having my own classroom. Wagner describes our students today as the Net Generation. They grew up digital and, as we know, it is integrated in every aspect of their lives. Our students are different than generations before. 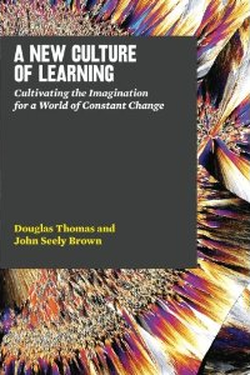 Wagner states that they no longer can learn effectively through lectures and interacting with the text, they learn through discovery and through creating. They want learning to be an active endeavor where they are interactive producers and not passive where they are isolated consumers of information. Some corporate leaders are concerned that the coming generations because they think they have poor work ethic, but what we need to understand is that they are motivated to work in different ways. Wagner talks about their continuous partial attention and their need to be busy, to be alive, to be connected and to be heard. In order to engage our students, I agree with Wagner when he says we need to catch up in the classroom with what kids can do outside of school. Think about how you search the Internet. You start researching one thing and that leads you to other links and new searches and the learning taking place and discovering information is interactive, and nonlinear. This is how we need to teach our students. In addition, the Net Generations has a different relationship with authority. As teachers, we are transitioning from the ultimate authority into facilitators of learning. We need to model our thinking of discovery, support students to take control of their learning through discovery and encourage creativity. Because, in fact, this generation’s motivation for a career is one where they are happy, making a difference and creating, so let’s prepare our students for that. Although all three of the schools described seem like awesome, progressive schools producing highly productive citizens, I feel like I would be happiest at High Tech High, location being one of reasons. I like that HTH doesn’t track their students by ability nor do they offer AP classes, yet almost all of their students go to college and many get into prestigious Universities. I don’t agree with tracking because it tells kids from a very young age what their path in life will be. I think tracking can stifle interests that have yet to surface in young teens. After what I have been reading about AP classes and how heavily they teach to the test, I am not convinced that students who aim to take multiple AP classes are necessarily being prepared for the current marketplace. I like that HTH focuses on rigorous activities for students and envision students “...being in the company of a thoughtful, passionate, reflective adult who invites you into an adult conversation which is composed of the rigorous pursuit of inquiry.” (Wagner) The classes focus teaching students to be deeply critical of less content. I like that students are held accountable and assessed through electronic portfolios displaying their best work, a substantial internship and a senior project before they graduate. I like that the school starts at 8:30, a more reasonable start time. I like that the bathrooms have murals and the students are constantly working hands on in classes and sometimes outside. And finally, it sounds like the principal at HTH is supportive of continuous growth of teachers in their career. I had the opportunity to observe at HTH in San Marcos and as I was walking through the halls, it definitely felt like an inviting learning environment I think I would be happy working in. Tony Wagner's conversation surrounding testing raised some great questions for reflection after 10 years of No Child Left Behind. I agree that teaching to the test and requiring students to simply recall facts and formulas does not prepare our students to be successful in college and the current marketplace. Motivating students is particularly important when it comes to their performance on tasks, but how many students are motivated to try their hardest on a standardized test that don't count for their grade? Are we really getting authentic results of the learning that happens in classrooms across the nation? Do we necessarily need a uniform system to assess students? Also, if we know these tests are bad for our education system, how are we going to hold students and teachers accountable and ensure authentic learning is, in fact, happening in the classroom? Wagner argues that we have an effective and more meaningful accountability system, but we don't necessarily have the political will to implement them. As far as testing and assessing my students in my own classroom, I am going to try and steer away from multiple choice tests and assess my students with more rigorous mathematics problems and projects in order to engage my students and develop the critical thinking skills they need to be successful citizens. Wagner takes a hard look at teacher training programs across the nation and concludes that most programs do not effectively prepare teachers for their career. Not only are teachers placed in a classroom without experience and the feedback they need, they start teaching and rarely get evaluated constructively. They essentially get isolated as a teacher and grow complacent with their teaching style. I feel that the co-teaching model at CSUSM is a more effective way to prepare teacher candidates for their first day of school. Having two semesters at two different schools, teaching and assisting in a variety of classes, and being observed and given feedback by university supervisors might be a system that Wagner would approve of. Of course, there are some skills that will only come from completely having your own classroom, but I feel that the rigor of the program at CSUSM adequately prepares us for our first year of teaching....although, we will see next year :) If I were to tweak the program in any way, I would have a little less focus on coursework and more focus on getting coaching through real life teaching experiences at our school sites and more lessons and teaching activities to have in our tool box. Not that this isn't a part of the program, but added focus on this aspect is what I would change. In addition, after reading chapter 4 and after being at two different school sites, I am realizing that the school you decide to teach at has a huge impact on your motivation and happiness as a teacher. It is important to choose a school and district that aligns with your teaching belief system and will give you support in the classroom, constructive feedback on teaching style, ongoing training, and be a culture where you think you can grow and be motivated. 1. 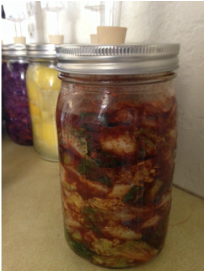 Besides cabbage, what are other fermented foods I can make? 2. What are the health benefits to eating fermented food? 3. What equipment do I need to ferment food? 4. Is there a likely risk that I can poison myself if I do not use clean enough equipment during the fermentation process? 5. How long does fermentation take for a variety of foods? 6. What are the ingredients necessary for fermenting food and which recipe do I like the best? 7. Is the food I ferment good enough for others to eat? 9. How long does fermented food keep before it spoils? 10. Is fermenting food a multi-step process and does it require advanced culinary skills? A successful 20% project will entail a variety of tasty and edible fermented foods. Success would also be incorporating these fermented foods into my regular diet to benefit my health! I enjoy cooking, so there is an element of play and making in my project. There is also an opportunity of failure: disgusting food that I will never eat. Wish me luck! THESE ARE MY STUDENTS! I found this video on visionsofstudents.org, where I was led after watching "a few ideas..." video collage from my previous post. "Generation Me" is very interesting and enlightening in regards to knowing my future students. They grew up thinking they are special .The majority of high schoolers believe that they will be more successful than their parents and that they will graduate college. So, there isn't a lack of motivation to be productive members of society, yet a lot of them don't and end up graduating AND they lack passion to pursue a meaningful career. What is happening between high school and college? Our students should be happier because they are growing up with more education, more technology, more communication, no drafts, more choices, etc., but depression amongst teens and young adults skyrockets. As an educator, it is important to be empathetic to the trials and tribulations that our students are going through. High schoolers are at such a vulnerable age where all that matters is protecting their self-esteem, yet they are still hopeful that they will be something in their lives. As role models for them during this time, teachers have to find a way to adapt to their world and encourage their dreams and passions and support their learning in a way that will foster productive and emotionally healthy adults. Michael Wesch put together a provocative video collage highlighting what college students are today. They learn to cook and play guitar on You Tube. Wesch quotes that they spend over half of their waking lives with media; they have spent an average of 5,000 hours reading, but 10,000 hours playing video games and 20,000 hours watching TV, email, Internet games and cell phones. He paints a dismal picture of classrooms as a place where students text during class, check their Facebook page, and guess at what the teacher wants them to say. He says most college students don't know what they want to do and that they are academically adrift. Wesch is pushing for change. He quotes students in the video saying that traditional education need to die. What does this mean for my future classroom? How am I going to convince kids that the mathematics we are doing in my class will benefit their future? It seems that I have to find a way to bring media into the classroom. I have to appeal to my students' interests and try to prepare them for a world that I am not familiar with. Can I call myself a teacher? You Tube is the teacher. We are apart of a new culture where everyone has a voice, everyone wants to share something, and we are all looking for the next video clip or tweet that will grab our attention for 4 seconds. What do I have to offer my students? Currently, I am taking a class at CSUSM titled "Secondary Education in the 21st Century" which focuses on technology use in the classroom. Twenty percent of my grade is a project based on Google's "20 percent time", which allows Google employees to take one day a week to work on side projects that surround their passions. I am getting ready to start my 20% project, which requires me to blog about the process of teaching myself one of these skills. Below are some ideas I have for my project. Please comment and let me know which one sounds like the best activity to pursue. 1. The Rubik's Cube: I love puzzles and games, so I was thinking about teaching myself how to complete the Rubik's cube in under 4 minutes. I would have to practice a lot and teaching myself would be easy because there are plenty of tutorials and instructions online. At the end of the 5-6 weeks I will spend on this project, there will definitely be a risk of failure if I cannot complete the cube in under 4 minutes. 2. Blind tasting wines: I have always loved wine and wine education. I have worked a lot with wine and I realize the more I learn about it, the more it seems there is to know. One skill I think is impressive is when sommeliers blind taste wines. For this project I would study 5 white varietals and 5 red varietals. At the end of the 5-6 weeks, I would be able to blind taste the 5 white and 5 red wines and identity the varietal and which region the wine is from. My reservations with this idea is the fact that I will be blogging about an alcoholic beverage and I'm pretty sure that is faux pas in the world of public education. Obviously, the element of failure in this project is if I can't correctly identify the wines after 5-6 weeks of studying. 3. Planning my next dream vacation: Traveling is a huge passion of mine. I have been thinking about a particular adventure now for a while. It includes flying to China and staying for a couple weeks then hopping on the Trans Siberian Railway all the way to Moscow. After that I would transfer trains through Eastern Europe and all the way down to Spain, cross the Straight of Gibraltar and spend a few weeks in Morocco. My project would include a lot of research on the adventure to determine the major sights I would see, how much time I would need, where I would stay, and how much money I would need. There isn't a huge element of failure here. 4.Learn how to ferment food: I am also passionate about food and gardening and I started to like fermented food when I taught English in South Korea because fermented food is a huge part of their cuisine.I like the way fermented food tastes and I know it is really good for a healthy gut. This project would include me learning about how to ferment food and ideally taking cabbage or other vegetables from my garden and fermenting them. Learning about it would be easy to do on the Internet and I would consider myself not failing if I am successful at fermenting some food and I like the taste! 5. Create a painting to hang above my bed: I have never been too artistic, but I hear it is a healthy activity. This project would require me to buy a canvas big enough to put over my bed and to create a piece of art using oil paints (is that even how to say it? That is an example of how little I know about creating art). I would watch videos online to give me ideas and tips on painting techniques. Success with this project would be a completed painting that I like enough to hang in my room.